This is my first experience with Brensan Studio Patterns, and my first impression is a very good one! While these patterns seem marketed to the "wearable art /quilting cotton" arena, I think many of the silhouettes will work quite well when made from classic fashion fabrics. 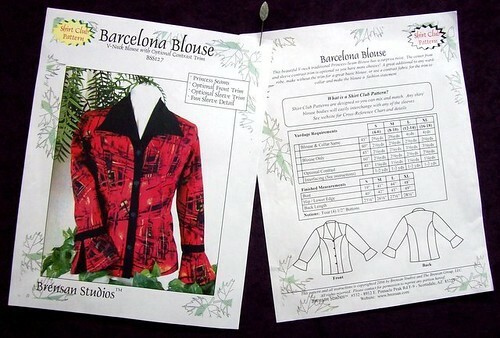 Below is a photo of the Barcelona Blouse Pattern Front and Back. Look past the rather garish red fabric, and notice the classic Princess blouse silhouette, with it's wing collar and split cuffs. I chose to make mine from a white medium weight jacquard woven cotton/lycra blend fabric from Gorgeous Fabrics. While the garment looks a bit clumsy on my ancient dress form, the fit on me is perfect. I can see making a couple more of this style, utilizing the design options given in the pattern instruction sheets...a contrast bias cut front band and contrast collar. Silk Dupionni would work with this style, and perhaps I'll make another with short sleeves in Linen. Please note that you are not seeing puckers...well you are, LOL, but they are the jacquard "highs and lows" of the fabric...not my sewing....really. 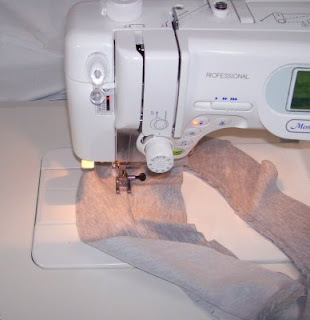 SEWING NOTES: Pattern Alterations- very few. I shortened the shoulders by 1/2" and the sleeves by 3/4". 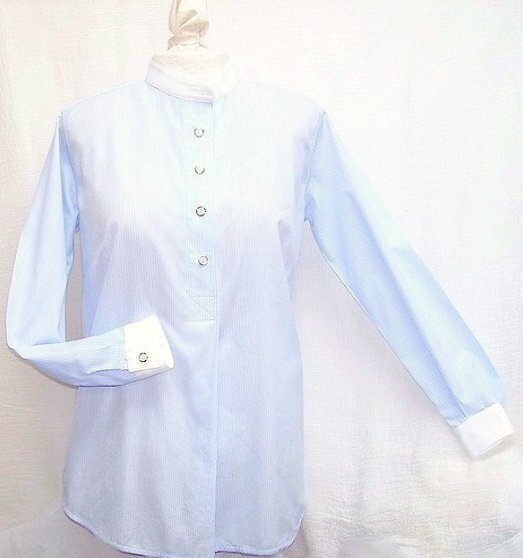 Shirt Collar and Cuffs interfaced with Pro-Sheer Elegance Fusible Interfacing, the back panel and fronts were faced with Pro-Woven Light Standard Sew-in Interfacing, both from ~Fashion Sewing Supply~. Buttons from ~Fashion Sewing Supply~. Fashion fabric from Gorgeous Fabrics. I have found my "make it 10 times" Summer Top! This pattern fits and flatters so well, that I've already made two. The first, from heather gray Cotton/Lycra Jersey and the other from Cotton/Lycra Jersey print. 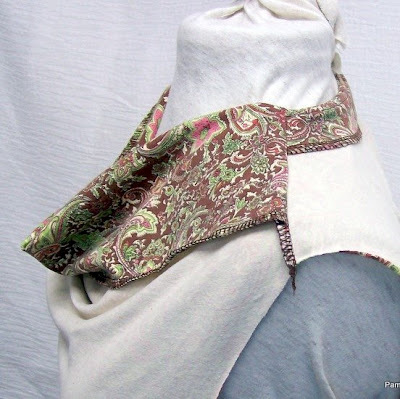 The print version has an inset neckband made from lightweight Irish Linen. You won’t believe how much mileage you’ll get from these great tops until you make them yourself! 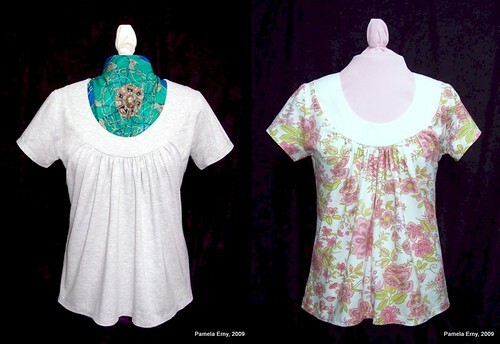 These tops are designed for T-shirt or knit fabrics with a little stretch. Try beading the neckband or add beads to the tunic drawstring for a pretty look. Relaxed, scoop-neck Tops are gathered onto a deep neckband at the front ...mix & match lengths & sleeve styles for your perfect top. 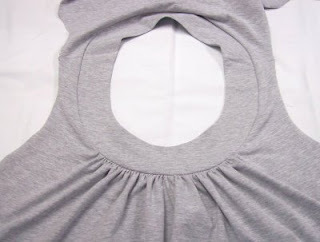 Tank is sleeveless with a ribbed hip band, T-shirt has cap sleeves and finishes at the lower hip, and Tunic has short sleeves and applied drawstring casing. Try these lovely tops with simple pants, skirts or shorts, under your favorite jackets or cardigans, or team them with your jeans for a great casual outfit. 1. Interface wrong side of one set of the neckbands, then stitch their shoulder seams. You now have a set of neckline bands...The Interfaced Under-Band, and the Upper-Band. 2. Place the bands RIGHT SIDES TOGETHER, and stitch the inner circle. Then clip the curve. Now you have ONE Neckline Band. 3. 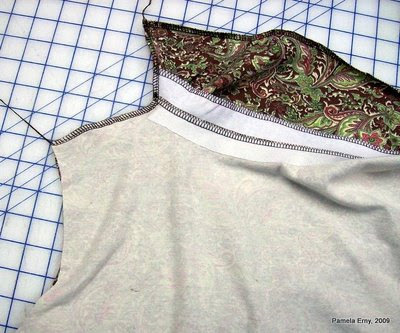 Under-stitch the the seam allowances to the Interfaced side of the Neckline Band. 4. 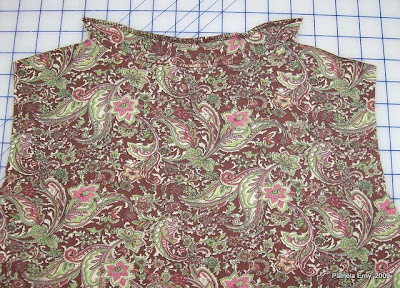 Match the edges of the Neckline Band, WRONG SIDES TOGETHER, and press. 5. 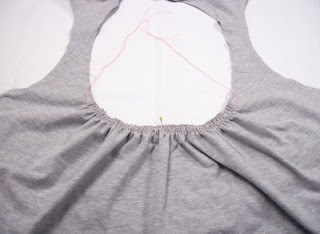 Sew the front bodice pieces Right Sides Together at the shoulder seams. Gather the front neckline between the notches. 6. Match the RIGHT side of the Neck-Band to the RIGHT side of the neck opening, matching the notches and adjusting the gathers as needed. 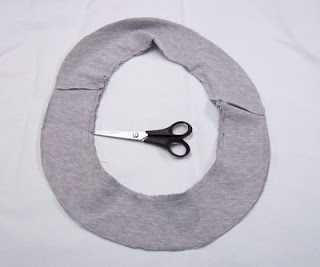 Stitch the Neck-Band to the shirt through all layers. 7. This is what the sewn neckline of the Sunshine Top will look like from the Right Side. 8. 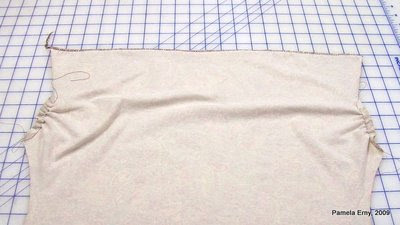 The last steps are attaching the sleeves and stitching the side seams and hems as you would with any simple top or T-shirt. SEWING NOTES: Pattern from HotPatterns, Pro-Sheer Elegance Interfacing from Fashion Sewing Supply, Fabric from my stash. Tops and blouses with draped cowls are among the most flattering neckline silhouettes. 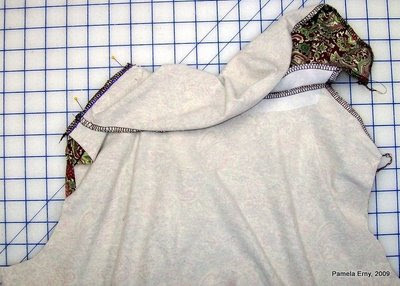 However, with many of these styles the shoulder seams tend to slip to the back. Not only that, but the inside can look very messy where the cowl drape facing meets the shoulder seams. Here is a way to solve both of these problems at the same time ..and works equally well for boat neck tops with cut-on facings too! In this example, the garment shown is the "Waterfall Blouse" from Ottobre Woman magazine, Issue 02/09 #5. Also, patterns for this style may have a separate Back Facing. If so, attach it. 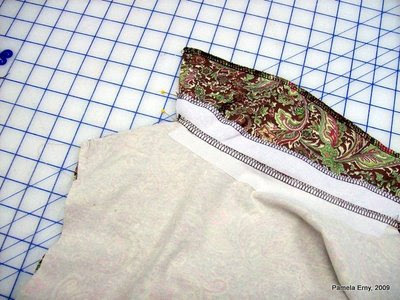 Next, fold the facings down towards the BACK meeting the shoulder seam and matching all edges. 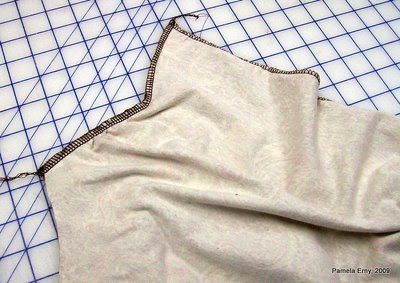 Stitch the shoulder seam again, though all layers (when you click on the photo to enlarge it, you will see the stitching line drawn in blue). Now turn (flip) the facings into position. Look! All those seams (shoulders, front facing, and back facing) are now neatly enclosed, as shown below. Also notice that the seams at the shoulder are now folded toward the Front. This is unusual, as we usually press shoulder seams to the back. 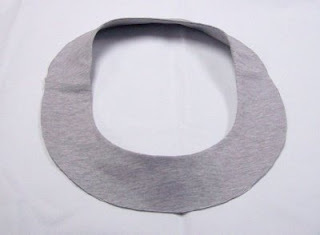 But with this style, having the shoulder seams folded to the FRONT helps the cowl fall into beautiful folds, and the tendency of these styles to "slide backwards" is solved! How much do I like this Top ? A Lot ! 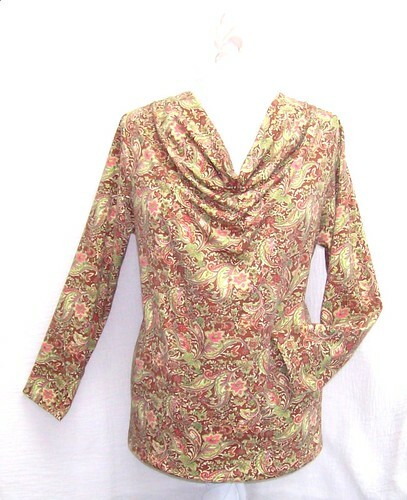 This top was made from a medium weight cotton/lyca knit without much drape...yet the neckline drapes beautifully. 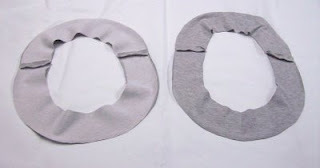 You can arrange the neckline folds in a "V" like I have shown here, or into a more rounded shape. 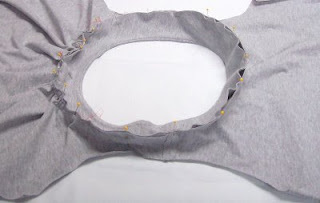 Please see the tutorial above, showing a way to neatly enclose all the facing/shoulder seams and encourage the neckline to fall into these nice folds. 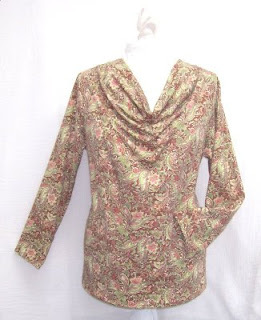 This style from HotPatterns is a relaxed-fit Shirt that has a classic yoke, slightly dropped shoulders and long sleeves with cuff and placket. The Shirt features a front half placket and pleat, and finishes at the lower hip with a curved shirt tail. You can choose the classic shirt collar and stand, or use the stand by itself for a funky Nehru collar. Yes...Though basic, the instructions were very clear and easy to follow. You need to cut the across the top of one of the pattern sheets to separate the instructions from the main page, but it does not in any way interfere with the pattern pieces. In fact, I found it quite handy to have them available this way. What did I particularly like about the pattern? I really like this style and will be making it again in a few different fabrics with different collars and sleeve lengths. 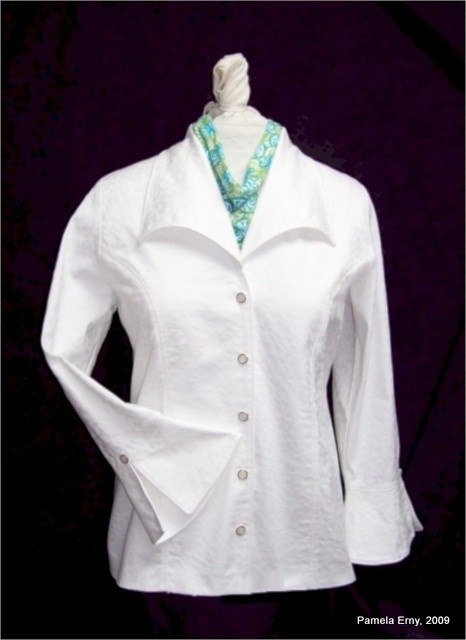 It is a wonderful wardrobe-building shirt that has a nice feminine drape because of bust darts, subtle side-seam shaping, and the lovely way the placket forms a body-skimming front pleat. I needed to make all my usual alterations because I am petite...barely 5' tall. I raised the darts, shortened the torso a little bit but left it at Tunic length, and shortened the sleeves. Would I sew it again? I will indeed sew it again... I am especially looking forward to making this style with washed Silk Dupionni .